I’ve been thinking about this whole mini-pedalboard for my “bass rig.” Anyway, I inherited a tuner, bought a cheap compressor, and got my trusty black Russian Big Muff Pi out of storage. I put them all together only to realize I have no way to power all the pedals and no more little instrument cables to go between the pedals themselves. First I tried to daisy chain them together. 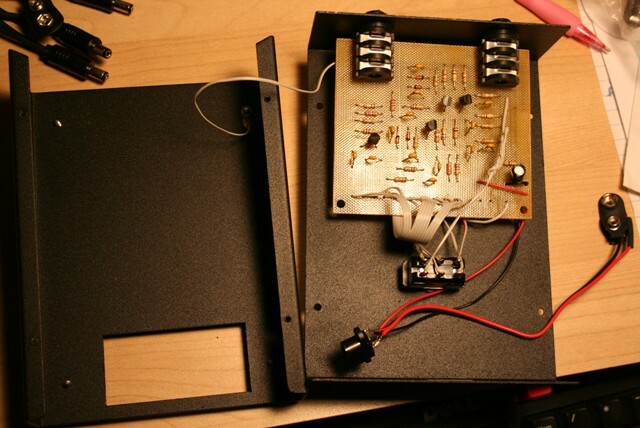 Then I tried to add a power input jack to the big muff…and it worked! Here’s where I got instructions on how to do it! Maybe someday I’ll get around to making it true bypass according to these instructions. This entry was posted in Building/Mods, Effects, Wanna Be by gtr1ab. Bookmark the permalink. Sorry. I don’t know what happened to the instructions. I will look for others. Good luck!